When I first started this blog, family and friends wondered why I was starting this venture. I jokingly replied, I want to be the next Curly Nikki. I am truly inspired by the movement she single-handily created. She has built a forum that inspired, motivated, and educated naturals all over the world. She is truly a role model to all in the natural hair community. Yesterday was an exciting day for me! 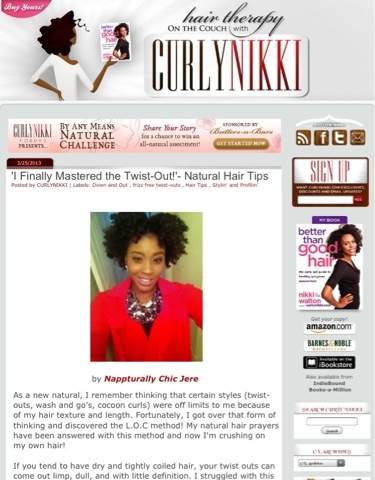 I opened my inbox and saw an email from Nikki Watson, editor of Curly Nikki. She emailed to tell me that she was going to use one of my blog entries on her website. Omgeeee!!! Thank you Nappturally Chic readers, YouTube viewers, Instagram followers, and Facebook fans. I never imagined I would receive the support and love that I have received in such a short amount of time. When I started this venture, about 4months ago, I did not see steady readers, 300 and counting Youtube subbies, 115 and growing Facebook Fans, or 900 and increasing Instagram followers. Reaching this astounding goal, a goal that I didn't even see happening so quickly, shows me that I'm walking in my purpose and that this is just the beginning and the best is yet to come. 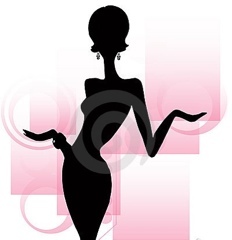 A special hug and love to all my Nappturally Chic-istas!!! You guys are awesome!! I do this to hopefully encourage you like so many have encourage me. My goal is to continue to motivate and inspire you all to be your best, live your best life, accomplish great things, see great things, look and feel beautiful, and to love every part of yourself as an example of God's wonderful creation. Thank you all!!! Lots of love!! !